Heat oven to 400°F. Grease bottoms only of 12 regular-size muffin cups (2 1/2x1 1/4 inch) with shortening, or line muffin cups with paper baking cups. In medium bowl, mix flour, cocoa, baking powder and salt; set aside. In large bowl, beat brown sugar, milk, oil, coffee and egg with fork or wire whisk. Stir in flour mixture just until flour is moistened. Fold in chocolate chunks. Divide batter evenly among muffin cups. Bake 18 to 20 minutes or until toothpick inserted in center comes out clean. Immediately remove from pan. 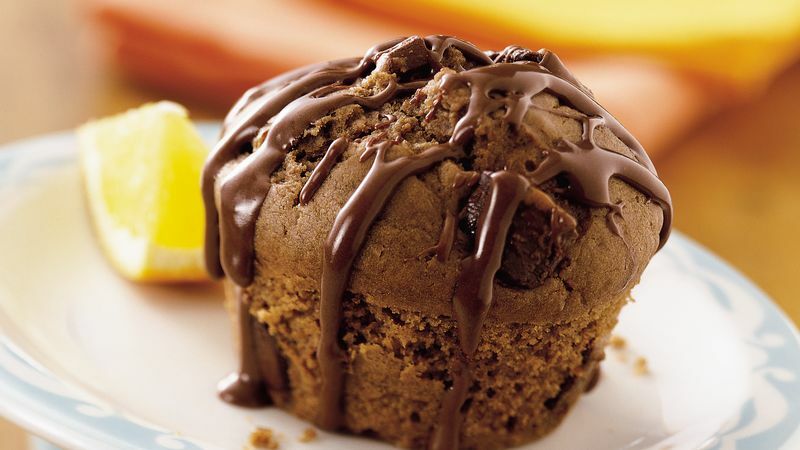 Drizzle muffins with a mixture of a teaspoon or two of brewed coffee and a spoonful of Betty Crocker® chocolate frosting.